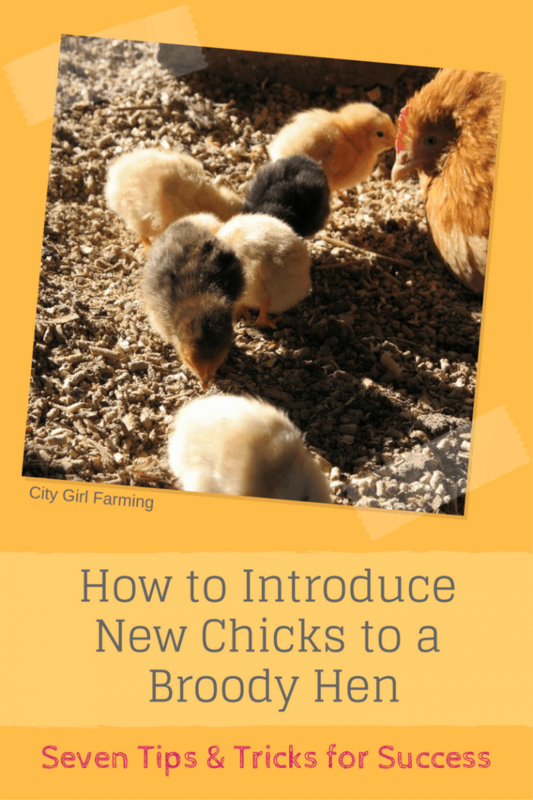 Wondering how to introduce chicks to a broody hen? While it’s not fool-proof, there are some steps you can take to help make it work. And when it works, it’s like magic. And so fun to participate in. Everyone should try it at least once. 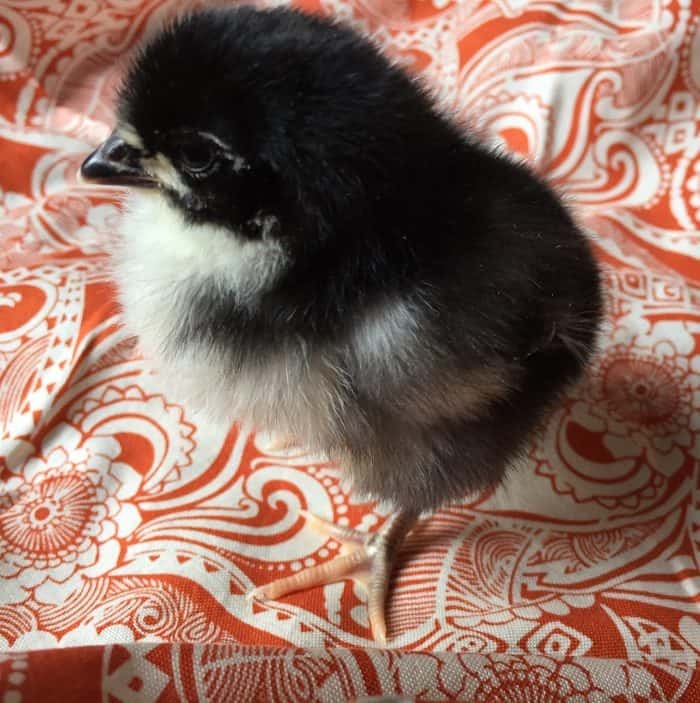 If you’ve ever had a broody hen before, you might have thought about giving her some chicks to raise (especially if you don’t have a rooster to fertilize eggs for her to hatch). It’s a great solution for everyone if you’re in the market for increasing your flock. And mama does all the work! She keeps them warm (no heat lamp). She’ll teach them how to scratch for food and take a dirt bath. And she will protect them and integrates them into the flock. It’s a beautiful union and way less work for you. It’s also amazing to watch a mama raising her chicks. They have their own little language and the babies mind mama (usually!). Even when they’re way too big, they still crawl in under mama at night, poking out from all sides of her because there’s not enough space. It’s heartwarming and fascinating to watch it all. And it’s usually pretty easy to pull off. 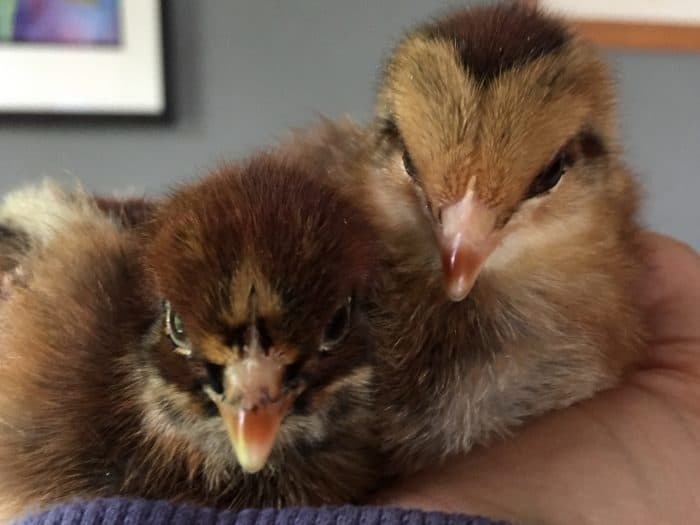 If you’re wanting to give your broody hen some chicks, there’s a few things you should know. First. It doesn’t always work. Usually it works. But not always. Sometimes mama rejects them. Sometimes the babies don’t imprint on her (therefore, they don’t understand, nor listen to her instructions). There are ways to lessen these things from happening, but there’s always a possibility that you’ll end up needing to raise them yourself, so keep that in mind. Wait a couple of weeks after your hen goes broody. She’s anticipating sitting on these eggs for 21-ish days. Don’t rush the process. Get freshly hatched chicks. 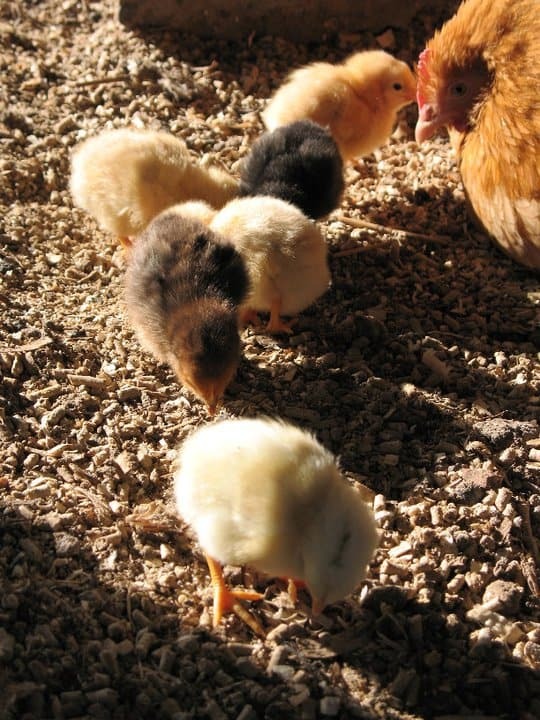 Call ahead to your local feed store and find out when the next shipment of day old chicks will be in. You want them as young as possible because you have a better chance of them imprinting on your broody hen. Make your plan based on the schedule of the feed store. 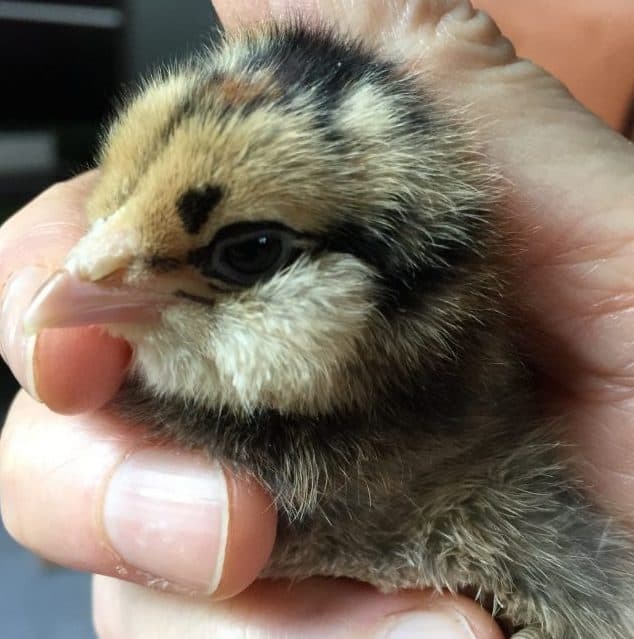 While you’re waiting for the youngest chicks you can get, move your broody hen to the place you want her to be with the chicks. Generally, it’s a good idea to get her out of the way of the rest of the flock for everyone’s peace of mind. Also, if she’s hanging out in a raised nest box, you’ll want her to be lower so she doesn’t lose her babies over the edge. It’s good to move her a couple days before the new babies arrive so she can settle in and feel calm and at home. Stick a few eggs under her (real or fake) so she’ll be content to sit and wait for them to “hatch”. When you pick up the chicks, resist playing with them and holding them. You don’t want them to imprint on you. You also don’t want them to smell like you. This is the hardest part. Baby chicks are irresistible. RESIST!! Find an old rag and rub it over your hen to pick up her scent. Carefully wipe it over the chicks to pass her scent on to them. Wait until it’s dark to bring the chicks out to your hen. They can’t see in the dark and are less aware of what’s going on. Not totally unaware, mind you. 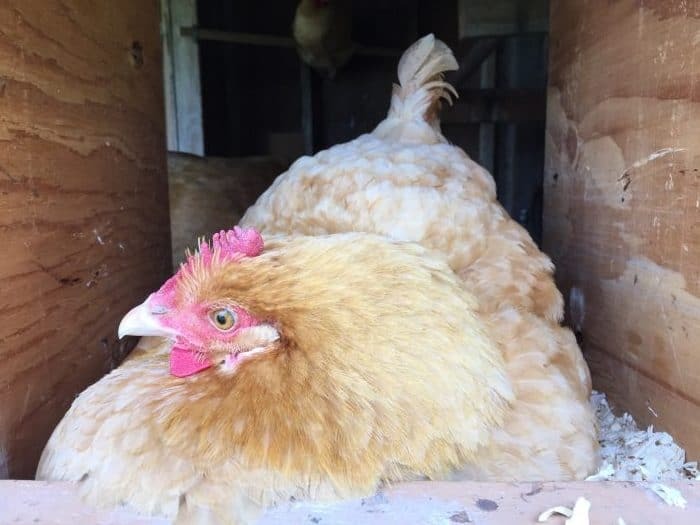 She still might want to peck you for messing with her and her eggs. But you’ll get a lot less resistance at night. Once the babies are scented with mama scent, take them out to where mama is waiting. Pull the eggs out from under her and stick the babies in. Here, in the dark, is where you get to experience the first magic. Wait for it. The chicks will be chirping. And mama should start cooing. Once this happens, you know all is well. Mama should take it from there and raise them right. Sometimes, however, even if you follow the steps exactly, you end up with problems. This happened to me this week. I did everything right (and I’ve done it successfully several times in the past). But there in the dark, the magic didn’t happen. Mama never cooed. And babies were strangely silent as well. Because all was calm, I decided to let them stay and check on them in the morning. After a restless night, I went out to check on the family and mama just didn’t seem right. She wasn’t interested. She was still on the nest and the babies were tucked warmly under her sleeping. But she didn’t seem like any mama hen I’ve seen before. It was almost as if she didn’t realize there were babies under her. And maybe she didn’t. I had to rush off to a meeting and when I came back, the whole coop was in an uproar. I raced out to find one of the babies running around the chicken run scared and cold. The other hens were freaked out by her. Thankfully. (It could have ended MUCH WORSE). I found another of the babies a few feet away, cold and scared. Baby number three was still under mama. So, I picked up the two cold, scared girls and stuffed them back under mama. Only, this time, she didn’t like it. At all. She started pecking all the chicks, including the one still under her. I scooped them up and stuffed them into my sweatshirt to keep them warm, found a box and heat lamp and set them up in the living room. This time around, I’m going to be mama, I guess. This is the first time this has happened to me, although I know there’s always at least a bit of a risk. Oh, and there’s still the issue of my broody hen! I’m now setting about breaking her of her broodiness (here’s how). I hesitated to tell you my latest story of Mildred refusing motherhood because I don’t want it to discourage you. It CAN happen. I’ve always known that. But it’s NEVER happened to me before, so I was actually kind of surprised by it (even though the possibility has always been in the back of my mind). It certainly won’t stop me from trying it again some day. I know it works. And it’s fun to be part of. On the plus side, since the babies are under my supervision now, I get to hold them and tame them myself. It’s not the worst thing in the world. It’s just a bit more work. Now I will have to keep them warm. And keep them healthy. And integrate them into the flock myself. But they’re chirping away in an empty appliance box beside my desk as I write this. How can I be upset by that? I’m getting a cuteness overload and I can’t complain about that!